This page is for anyone who needs to use Chinese handwriting input or change the entire user interface into Chinese in versions of Windows 8 released outside of China. Chinese handwriting input in many cases requires installation of a display language pack, so I thought I'd cover both of these on the same page. I will also show you how to access the old IME Pad in Windows 8 as well. If you're new here, see also my quick introduction to Chinese language features in Windows 8 and input method setup pages. We're on the desktop because, as I've explained elsewhere, setting up language features from the tablet interface often prevents you from getting to all the options you may want, especially in Windows 8.1. OK? Now we're ready to install and adjust these optional features. Note: outside of Taiwan, "Chinese (Traditional, Taiwan)" does not include a display language pack or handwriting! 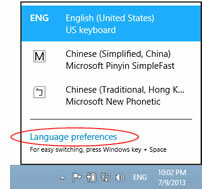 In the global Windows 8 release, these features are only available to you in the "Chinese (Traditional, Hong Kong)" or "Chinese (Traditional, Macao)" regional language options. Then install "Chinese (Traditional, Hong Kong)" or "Chinese (Traditional, Macao)" instead. If you are unfamiliar with these control panels, see my Pinyin setup page (even if you are not planning to use Pinyin; that is my main Windows 8 setup page). When you have you can go to "Options" as described above to open the language options control panel. 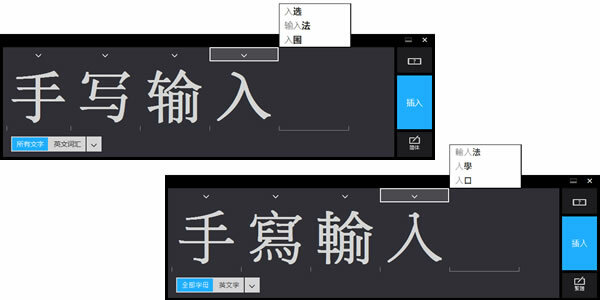 Simplified Chinese handwriting may already be installed in some Windows 8 systems, but the language pack must still be manually installed if you need that too. If you don't see the handwriting options here, first install the language pack by selecting "Download and install language pack". 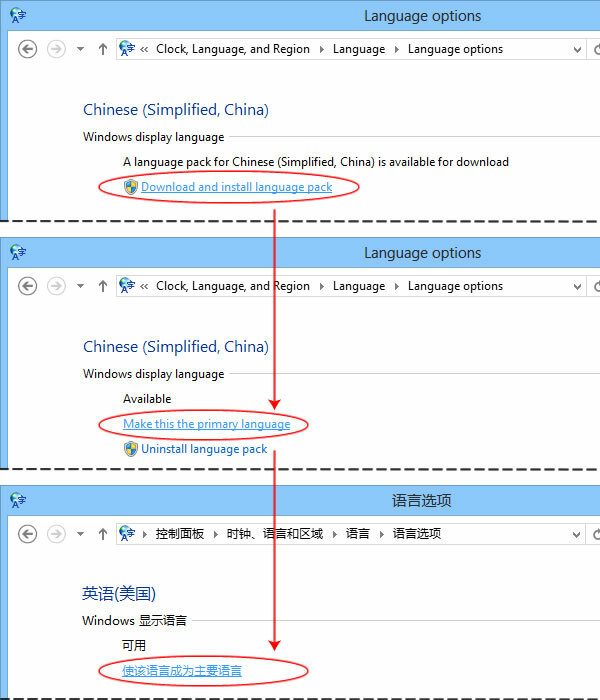 Also install that language pack if you want to change your user interface (UI) to Chinese. Traditional Chinese handwriting requires that the language pack be installed before handwriting will be available. Select "Download and install language pack" to install these optional handwriting and display language features. Handwriting options for each form of Chinese will be found in that same language options control panel (after installation of the display language pack if required). These options allow you to choose cursive or print handwriting, the number of characters included, and "Personalize handwriting recognition" to help the system learn your handwriting. In Windows 8.1 they seem to have combined and removed the choices "Write characters in freehand" and "separately". Also, only the Hong Kong or Taiwan region options offer "Recognize rarely used Chinese...", and "Personalize handwriting recognition" only seems to work for Hong Kong and Taiwan, and not mainland or Singapore. You do not need to change the display language to Chinese for handwriting or any other Chinese reading/writing features. They will all work in the English interface, and they also work in all (or most) other languages and locales too. Many people assume handwriting will be listed with the input methods in the language/taskbar menu and related control panels. It is not there! Once you have completed the setup above, it will simply be added to the Touch Keyboard. The Touch Keyboard should pop up as needed when in the Metro/Modern tablet interface, but on the desktop you'll need to invoke it manually. To do that you'll need the Touch Keyboard icon on the desktop Taskbar. If you don't have that icon yet, go to the desktop Taskbar. If the Taskbar is hidden, hover or swipe down in that area. Right-click (or press-hold-release) on the Taskbar, and in the context menu select Toolbars > Touch Keyboard. Click that icon, select the handwriting layout (circled in red below), you're ready to do some Chinese handwriting! DO YOU PREFER THE OLD-STYLE IME PAD? Simplified Chinese users can skip this next section and jump to the display language packs, but there is an additional (ancient, preserved, 1,000 year-old) "Easter egg" waiting in Windows 8 for Traditional users. 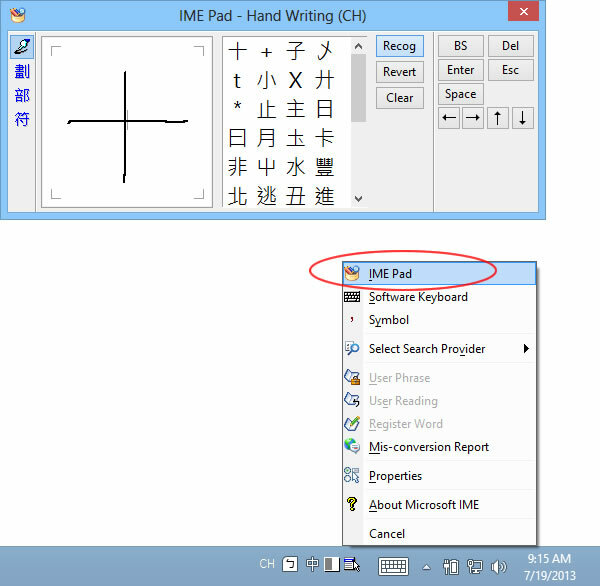 Traditional Chinese users also have the IME Pad for handwriting, stroke, radical, or symbols input when in desktop mode. To access the IME Pad, you'll need to revert to the old-style input method Language band/bar. Go to the Language control panel again, but this time look in the left column. Click "Advanced settings" there. Then in Advanced settings, under "Switching input methods", check the box next to "Use the desktop language bar when it's available", and then click the Save button. Back on the desktop Taskbar, at the right end of the language area you'll find the Tool Menu. On the top, in Windows 8 Pro, you'll see the IME Pad. Select that, and the floating IME Pad will appear for your use in handwriting, stroke, radical, or symbols input. DO YOU WANT TO CHANGE THE WHOLE SYSTEM TO CHINESE? If you want your entire interface in Chinese, go back to the Language control panel and click "Options" for your Simplified or Traditional Chinese IME (as explained above). If you haven't already done so, select "Download and install language pack". 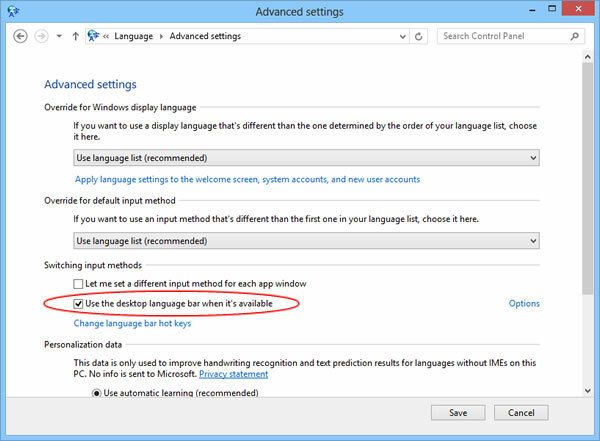 After it is installed, in the same place you will see the option "Make this the primary language". Select that, allow the system to log you out, and when you log back in you'll be in a Chinese system. To switch back to English, open the options for English and click in the same spot.